Malone’s closest friend and confidante is Judge Fox Clane, a rambunctious former congressman who has suffered his own tragedies in life. Some seventeen years have passed since Judge Clane lost his son, Johnny (to suicide), his daughter-in-law (who died in childbirth) and his wife (to cancer), but the death of his son in particular continues to haunt his thoughts. The Judge could not believe in the possibility of this; he wanted to shock Jester to the gravity of the situation. His eyes challenged his grandson to react in the spirit of Southern gentlemen. Jester befriends a local black boy, Sherman Pew, a bright, confident and articulate orphan who, as a baby, was left abandoned on a church pew. Sherman is unaware of the identity of either of his parents, but is especially keen to find his mother. Pew is also connected to Judge Clane in more ways than one; he once saved the Judge from drowning, and is now in Clane’s employ as an ‘amanuensis’ to write letters, read poetry, fix drinks and attend to his medical needs. At times, Sherman revels in his position as Judge Clane’s ‘jewel’; he considers himself a cut above the other household help and often behaves in a rude or fickle manner towards Jester, whose feelings for Sherman run deep. As the narrative unfolds, we learn more about events in the past, revelations that shed a different light on the connections between these characters. The circumstances surrounding Johnny’s suicide become clear to Jester prompting him to choose a particular path for the future. And when Sherman discovers information regarding the identity of his parents, the consequences of subsequent events touch all the main players in this novel. I greatly enjoyed Clock Without Hands; the four main characters, particularly Judge Clane, are skilfully realised. McCullers explores some thought-provoking themes with great insight and understanding of the human condition. Malone and Judge Clane both experience periods of isolation and detachment, but their responses differ; Malone faces up to his own mortality and seeks solace and understanding in the church (although few answers are forthcoming); Clane feels threatened by the prospect of racial integration and aims to guard against any advance in this movement. Perversely, there are times when he seems to forget that Sherman is black, but the Judge’s relationship with this young man is born out of guilt as well as gratitude for saving his life. Ultimately, Clock Without Hands focuses on interracial tensions and injustices and how these ‘sit’ alongside our beliefs and principles. The novel’s title is significant here; racial integration would move the clock forward, but Judge Clane seems content for the South to remain in the early-sixties or revert to bygone days. 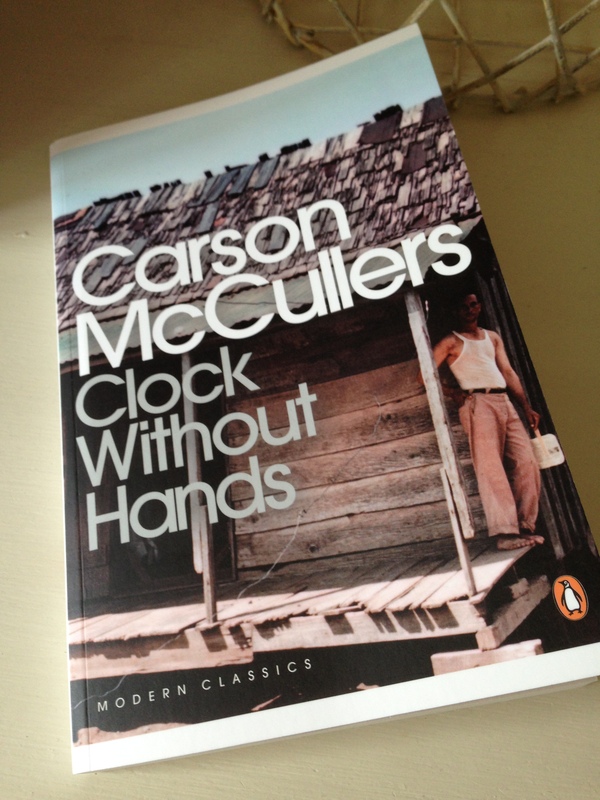 Clock Without Hands is published in the UK by Penguin Modern Classics. Source: personal copy. This entry was posted in Book Reviews, McCullers Carson and tagged #ReadWomen, #ReadWomen2014, Book Review, Carson McCullers, Fiction, Penguin Modern Classics, US on September 30, 2014 by JacquiWine. I studied The Heart is a Lonely Hunter at university, and then went on to read this one and The Member of the Wedding as well. I’d recommend both of those. Thanks, Lisa; that’s good to hear. I guess I should have started with The Heart is a Lonely Hunter as it was her first novel! An amazing debut, that’s for sure. I must read it. Cheers, Lisa. Another one for the list! I remember being brought up short by an essay in Ann Patchett’s The Story of a Marriage about seeing the Ku Klux Klan marching down the main street of her home town. This would have been in the ’60s. Yes, it’s horrific to think that these incidents happened within our lifetime. I was just writing a comment here when my Internet connection crashed – and it took two hours to recover. Anyway, I lost my train of thought, but it was something along the lines that this is one Carson McCullers books that I haven’t read, but she has an inimitable ability to see into the heart of disappointments, to describe lost characters in search of meaning, identity, purpose in life. It sounds really compelling, especially when you consider that at the time the book was reading, these issues were still unresolved (as if they are now… ahem!). Argh, how annoying! I hope you’re up and running again and thank you for dropping back to comment; I’m glad you persevered. Yes, I agree she does have that rare quality; it’s what I was trying to get at with my comments on her insight and understanding of the human condition. She writes with such compassion and empathy too, but never in such a way that feels sentimental. Yes, a very compelling book for its time and still of some relevance today, sadly. I studied McCullers as part of a Uni course on Southern Literature and really love her work. The Heart is a Lonely Hunter is just a wonderful book. How wonderful, Cathy. I wished I’d studied literature instead of going down the science route at Uni. It sounds as if I should read The Heart is a Lonely Hunter as my next by McCullers. It’s funny Jacqui, I took the course on a whim and they are the books that have stayed with me the most – McCullers, Faulkner and Flannery O’Connor. Glad you enjoyed it. That’s great to hear, and it’s funny how things work out that way sometimes. I must try Flannery O’Connor as I’m sure I’d like her. Got Ballad of Sad Cafe & other stories on my tbr mountain – but from review & comments can see me acquiring more. I second Cathy re Flannery O’Connor – I think you’d love her – she was quite brilliant at capturing human behaviour & nuances. Ooh, I look forward to hearing how you get on with Ballad of Sad Cafe. I definitely want to read more by McCullers. And thanks for the link to Flannery O’ Connor story you posted on twitter, I’ll have a read of it during the week. A short story is the perfect taster for a new-to-me author! I read “The Ballad of the Sad Cafe” many moons ago – alas I can remember nothing about it…. :S Perhaps time for a revisit!! Haha, I can remember very little of some of the books I read many years ago, so you’re not alone. It’s good to revisit authors every now and again, and I like the way you cover a mix of classics and recent releases on your blog. I do like the fact that some of these characters seem terribly flawed. Sometimes I think that authors have trouble getting into the heads of people like Judge Clane. It is commendable when a writer gives it a try. Thanks, Brian. I guess it’s often the flaws that make characters feel more human and alive. McCullers does a great job in fleshing out the different sides to Judge Clane’s character, and she’s using him as a focal point for many of the novel’s themes. Thanks for a very evocative review . . . and for the reminder. I bought myself The Heart is a Lonely Hunter a few months ago, realizing I’d managed never to read any McCullers. The book’s glares at me accusingly from the shelf every now and then. I really must get round to it soon! Glad to be of service, John! Looks like you’re on to a winner with The Heart is a Lonely Hunter, and I’m sure I’ll be buying a copy myself before the year is out. Sometimes it’s a case of being in the right mood for a particular book, don’t you think? Some of my books have been sitting on the shelves for a few years, but I know their time will come. Some of my books have been sitting on the shelves for a few years, but I know their time will come. I have literally hundreds in this limbo! I have a couple of McCullers novels on the shelf but not this one, and this one does sound interesting–although to be honest I usually avoid novels in which death and disease are guests at the table. It sounds as if you might be better off with the ones you have, Guy, as the leukemia diagnosis does hang over Malone like a death sentence from the opening pages. I really liked her writing style though and definitely want to read more. Ok, I’ll pas on it then. Lovely review Jacqui. I recently bought The Heart is a Loney Hunter and am looking forward to trying it one day soon. That was the only one I really knew anything about. I’ll keep an eye out for this one too now though. Thanks, Lindsay. In some ways, I wished I started with The Heart is a Lonely Hunter as it was her first novel, but there we go. Lisa and Cathy liked it a lot, so it sounds as if you’ve picked a good one. Great review. Yet another American writer I haven’t read (this is becoming a theme). However I have decided that October will be American lit month in my life at least! Thank you. Well, October is a good month to choose because November’s shaping up to be German Lit Month! Looking forward to seeing your choices for both (assuming you’re thinking of joining GLM). Ah, lovely to be reminded of a fabulous novel by a wonderful female writer. I was lucky enough to discover her in my late teens (won’t say how long ago that was) and so pleased she is still being read. That’s nice to hear. I wish I’d discovered her earlier, but I’m sure I’ll read more by this author in the future. I’ve loved all the Carson McCullers books I’ve read…but I haven’t read this one! I always thought that it was unfinished and so wasn’t too eager to read it. Ooh, I knew Clock Without Hands was her final novel but wasn’t aware it might have been unfinished. It doesn’t read that way as all the strands in the narrative seem to reach a point of closure at the end of the novel. It’s worth a look, especially as you’ve loved her other books, and it might be interesting to compare with her earlier ones. I’ll definitely have to check it out and re-read some of the others as well. I think it must have been my mistake in thinking it was unfinished. No worries, Jonathan. She did leave an unfinished work at the time of her death, but if Wikipedia is to be believed it looks as if it was her autobiography. I’d be very interested to hear how you think Clock Without Hands holds up to her others. I read The Heart Is A Lonely Hunter MANY years ago …..really should read some more stuff by her. Great review . Thanks, Helen. I think you’d like this one very much. The Heart is a Lonely Hunter is firmly on my list; in fact, I should have started there!. Sad Café’s a novella, I believe; perhaps the novels were her forte. Interested to hear what you think of the ones you have on your shelf as when you get them, Seamus. The Heart is a Lonely Hunter was one of those novels I was required to read growing up in the South, and requirements like that can put one off a book and a writer for some time. So I was surprised when I picked up McCullers as an adult (Reflections in a Golden Eye) to find how really good she is (and yes, especially at exploring the weird psychological nooks of the South). This one I have not read; thanks to your post, I’ll try to remedy that one of these days. Ah…thanks, Scott. I can relate to that experience of being made to read something as a child or teenager, and I suspect many of us have encountered something similar. I recall having to read Thomas Hardy, and the requirement to analyse the life out of The Mayor of Casterbridge at school turned me off this author for several years. I do want to read more by McCullers, though, so I should take a look at Reflections in a Golden Eye. In other news, Beautiful Antonio, Madame de and Eric Ambler’s The Light of Day have all made their way onto my bookshelves in recent weeks, so thank you for those recommendations! I’ve read Ballad and liked it, but like Seamus didn’t love it. I remember it fondly though, and I think the writing was good. She seems to have a thing for flawed characters, going from that and this. Will you read Heart do you think? Eric Ambler, I’ll be curious to see what you think of that. I’ve not read him yet but he’s definitely on my radar. Madame de is a delight. There’s a review at mine, but in summary I thought it genuinely excellent and absolutely loved it. How nice to have a comment from you on an older post. She does seem to have a talent for characterisation, and what I like about this is her ability to write about flawed/damaged characters with insight and compassion, to render them human in a way that feels convincing. Ballad of the Sad Cafe sounds like one to skip, for now at least. Yes, I’m keen to read Heart as so many others seem to have enjoyed it (and there’s a Thievery Corporation/David Byrne track which I love with the same title). I probably should have started there but never mind. Eric Ambler – well, Topkapi: The Light of Day came via Scott so I’m sure it’ll be great. Next year, hopefully. I also have Ambler’s The Mask of Dimitrios to read, another recommendation (from realthog). I hadn’t realised you’d reviewed Madame de! I’d been eyeing it up, but hadn’t seen a review anywhere, and then I happened to notice it on Scott’s list of books read this year (a re-read I think). There isn’t a review as far as I know, but he loved it too. I’ll take a look at your review over the weekend. Cheers, Max.